It is a time of evil in Terrinoth. A comet rains corruption across the realm, dark priests conduct sinister rites, and even the hearts of your good and stout companions are turned to evil. Even you are not immune to the effects of this star, and when the greatest heroes clash and fight to destroy each other, only one will be left alive. 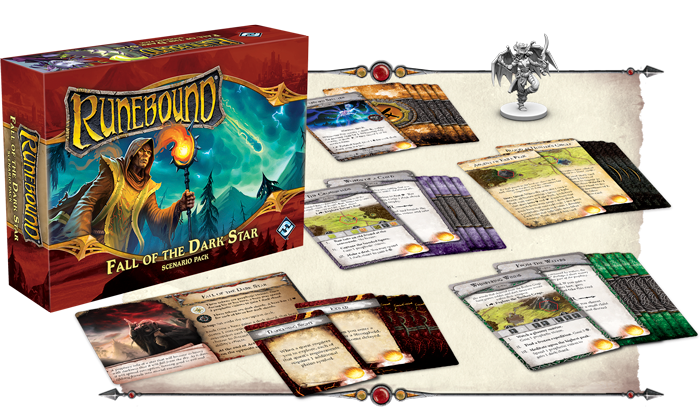 Enter a sinister future for Terrinoth in the Fall of a Dark Star Scenario Pack for Runebound! 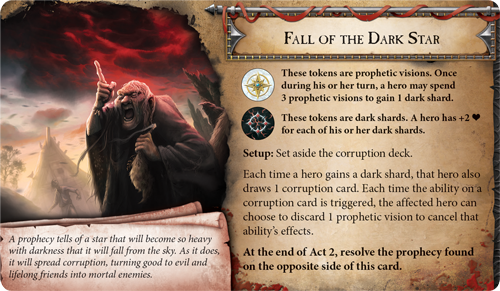 Following the footsteps of the Caught in a Web Scenario Pack, Fall of a Dark Star introduces an entirely new scenario to the game, paired with thirty new adventure cards and ten new story cards that give the scenario its own unique flavor. And of course, you’ll also find an entirely new hero, giving you a new foundation to forge your legend as you adventure across the realm. 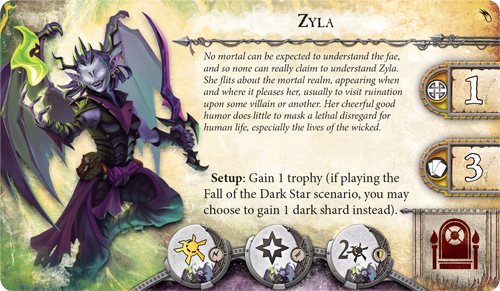 Today, we’ll preview the darkness that engulfs Terrinoth in Fall of a Dark Star, starting with an new hero: Zyla. When you take on the persona of Zyla in a game of Runebound, you become a creature utterly alien to Terrinoth. Unlike a human, dwarf, orc, or elf, Zyla comes from another realm—and she often seems to break the rules that govern the rest of the world. For instance, Zyla begins the game rolling four dice in movement, exemplifying the way that she can slip in and out of the mortal realm. Click the card above to view the reverse side. Zyla’s combat tokens also illustrate her arcane approach to adventure. Not only does she have plenty of ways to deal magical damage, her unorthodox fighting style grants her the tactics symbol first introduced in The Gilded Blade Adventure Pack. As before, you can spend the tactics symbol to copy a symbol on another combat token, giving you an unparalleled ability to adapt to your opponent’s actions. You’ll also be able to draw on Zyla’s esoteric abilities to shape the course of your adventures during the game. Channel Chaos allows you to suffer damage in order to reveal more cards during an attribute test, increasing your chance of success in exchange for a little blood. Alternatively, you can spend a surge in battle to magically Transfix your enemy—choosing one of your opponent’s spent tokens and preventing him from casting that token in the next round. 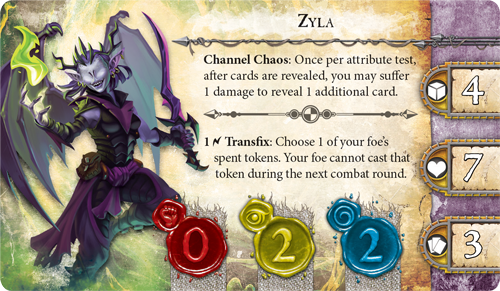 The dark times that Zyla has seen approaching will take all of Terrinoth by storm, radically changing the landscape and the way that you’ll approach your games of Runebound. 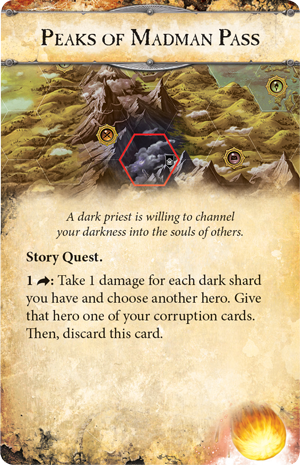 Throughout the game, you’ll have chance to acquire prophetic visions or dark shards. 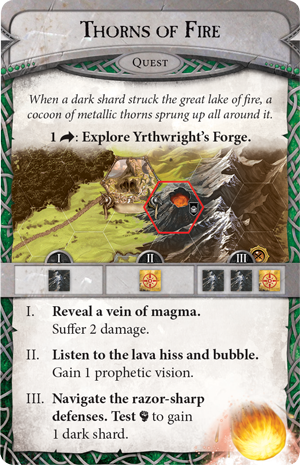 These dark shards are mere fragments of the corrupting comet that falls towards Terrinoth, but they do possess strange and unknowable abilities. For each dark shard that your hero possesses, you can increase your health by two, but these dark shards do not come without a price. 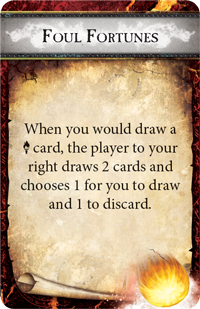 Each time you gain a dark shard, you must draw one of the fifteen corruption cards included with this expansion—and each corruption card offers a unique and dangerous drawback. 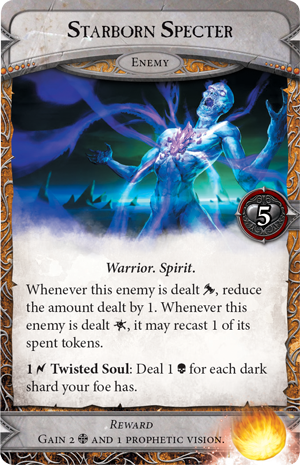 Aura of Rage forces you to take damage at the start of combat, Blackened Soul prevents you from entering shrines, and Foul Fortunes allows your opponent to choose which exploration cards you receive for the rest of the game. The only way to avoid these punishing effects is to discard your prophetic visions. You may believe that you’d be better off avoiding these corruption cards entirely, assuming that increased health isn’t worth the price. You’d be wrong however, and you’d realize it as soon as the scenario endgame comes around. At the end of Act 2, each hero heals all damage then moves into the Cursed Ruins. Then, a multi-hero fight to the death begins and the only hero left standing wins the game! At this point, the extra health you gain from your dark shards may be the only thing that keeps you alive in the face of your rival heroes’ attacks. The game will end with you battling your rival heroes, but there will be plenty of chances to test your might beforehand. 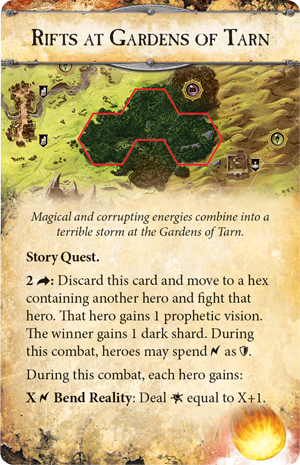 Story cards like Rifts at Gardens of Tarn and Brawl at Dawnsmoor give you chances to battle your opponents and get a sense of how dangerous they’re becoming. 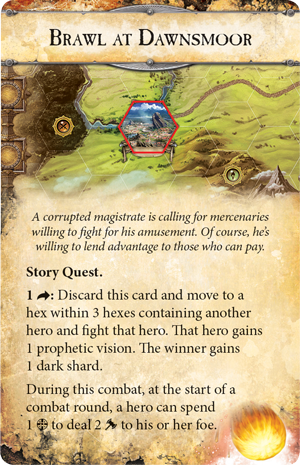 Alternatively, if you just want to hobble your opponents with corruption cards, you may use Peaks of Madman Pass to choose one of your corruption cards and pass it to an opponent! You’ll also face dangers in the adventure cards you encounter as you’re shaping your hero and customizing your powers. Starborn Specters may grow from the falling shards, responding to every attack with unexpected resilience. You may navigate a cocoon of metal thorns that has surrounded a lake of magma. Or, you may listen to the babbling of a madman who has pierced his tongue with a shard from the dark star. 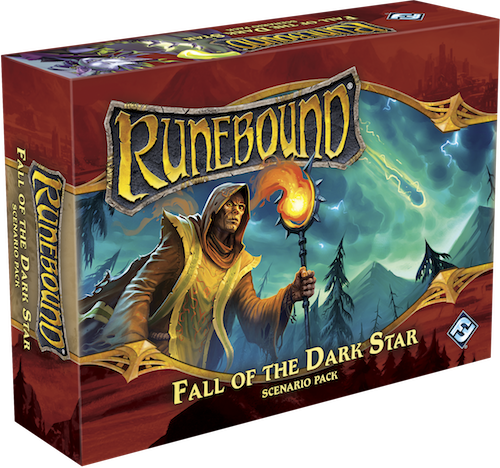 No matter what adventures you encounter, you can be certain that your games of Runebound will never be the same with the addition of the Fall of a Dark Star Scenario Pack. 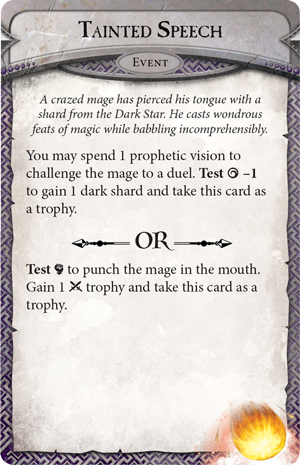 All of Terrinoth is falling under the sway of the dark star, including you. You must begin your adventures, preparing for the day you inevitably face your fellow heroes in combat. 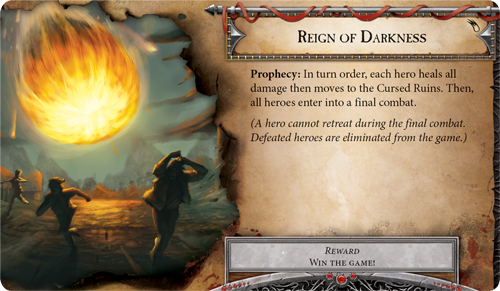 Pre-order your copy of the Fall of a Dark Star Scenario Pack at your local retailer today!